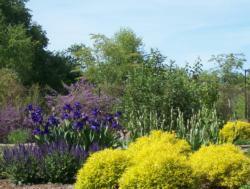 Beautiful, healthy landscape plants are the goal of every design. What role will the plants play? How much space will the mature plant fill? Measure your available space. Choose a plant whose mature size will not require constant pruning to keep it within that space. What irrigation is available and what else is watered on this valve? Match plants with similar watering requirements for the health of the plants and to conserve water. Most landscape plants' general water use can be found on the Water Use Classification of Landscape Species website. Is this plant suitable to my climate and my site? Look for site conditions such as full sun, part sun or shade; level or sloped ground; heavy clay or well-drained sandy loam soil. Check the recommended references below to see if your desired plant is recommended for your site and climate zone; San Joaquin County is in USDA zone 9 and Sunset Climate Zone 14. Be sure the plant is not considered invasive for your area. You can DOWNLOAD THE 2016 PlantRight List with pictures or visit PlantRight.org to learn more. For free sustainable landscape design plans, visit The New California Landscape. The resources and links below will help in choosing, planting, and maintaining the best possible plants for your SUSTAINABLE gardens and landscapes. Several of the book resources contain lists of plants for specific categories like hedges, shade plants, or plants with colored foliage. Plants for low water-use, low-maintenance, and pest and disease resistance. Also has planting plans for theme gardens.